I have never really liked the fashions of the 1920’s, having mostly seen the latter half of the decade, with its severe, skinny, almost masculine lines and boyish hair. Though some women make it look smashing, it’s not “me”. I like soft lines, traditionally feminine hair, and longer skirts. 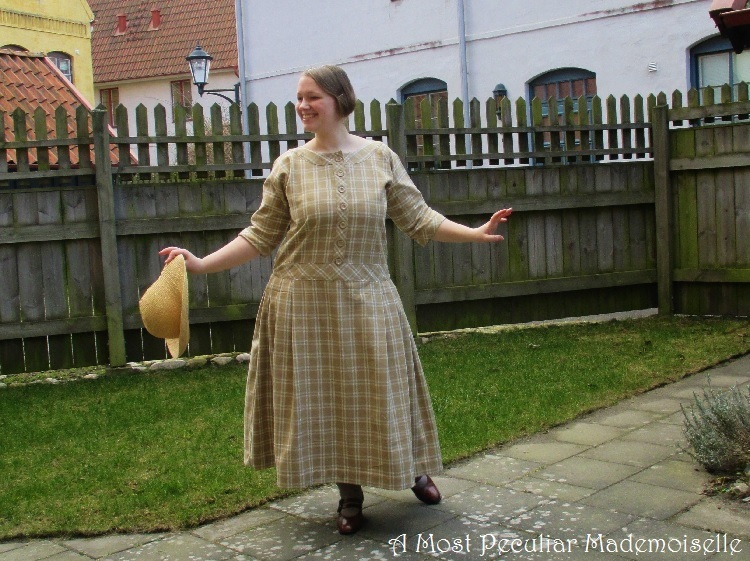 At the same time, I remember when I was given a low waisted dress as a girl, and feeling like the girls in Astrid Lindgren’s “Alla vi barn i Bullerbyn” (“The children of Noisy Village”), with all of the perceived romance of history, though of course I had no words for my feelings then. But as we are invited to a 1920’s themed birthday party this summer, my imagination was caught. After looking at lots of fashion plates and photos of real women of the early 1920’s, I’ve come to appreciate that part of the decade. 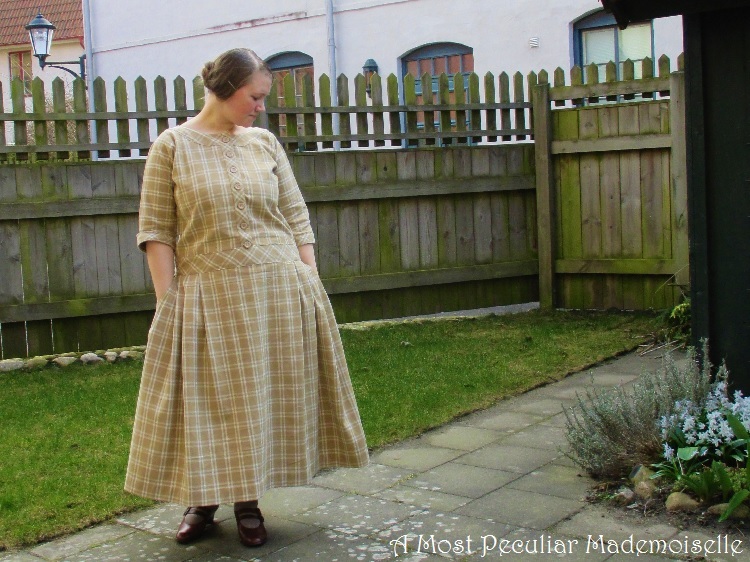 Not sure if the unfitted, low-waisted silhouette would work for me, but at the same time feeling it would most likely make a very comfortable dress for the days when my usual dresses with their tightly fitted bodices doesn’t feel tempting, I decided to make a very simple one, working both as a trial run and an everyday house dress. Inspired by the dresses worn by the farm wives of Bullerbyn, I used a checked cotton fabric that my mum gave to me many years ago. I used the sketch by Jen Thompson as a starting point, but changed it to my measurements. 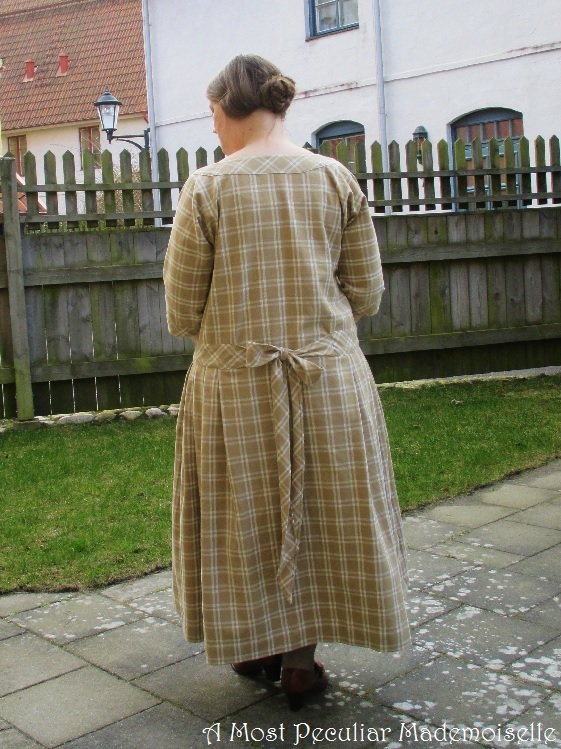 I also made it all in one piece by removing the shoulder seams (inspired by several dresses in period photos), and made darts at the shoulders for a little bit of shaping. I made it front opening, and made the sleeves longer. The bias trim at the waistline continues as ties in the back, as I wanted something to take focus away from my too-big-for-the-1920’s behind. Most of this project went smoothly, but for one thing. I was ready to start on the buttonholes late one night, but very wisely decided I was too tired to safely begin such a project. 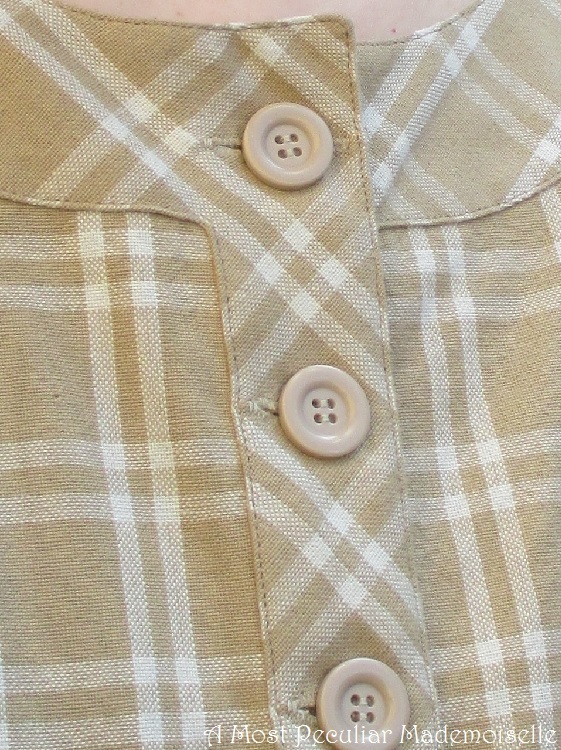 You can imagine I was a bit annoyed when I still managed to mess up the top buttonhole the next morning. After some thinking I managed to mend it tolerably well, but it’s still visible if you know what to look for. Ah well. The buttons were scavenged from an old, worn out cardigan. The whole dress was hand sewn, as my sewing machine is still out of order. I doubt we’ll have the funds to repair it this year, so The Greatness of Hand Sewing is the working theme for 2016. I did not make a period appropriate brassiere at this time, but might do so in future, as it would greatly improve the look. Not that I look particularly wrong; there are plenty of pictures of ordinary 1920’s women with visible curves and a non-flattened bust. It would seem not everyone could afford or be bothered with being that fashionable. Getting my hair in an acceptable style for the early 1920’s took lots of looking at period photos, some thinking and experimenting. My hair reaches past my tail bone at the moment, so it had to be one of the long-hair-posing-as-a-bob kind of styles. These are also abundant in period pictures, and noticing the similarities and differences was fun. I tried to comb the front of my hair really far down my forehead, but it would slip back again. Over all, I think it turned out all right, though I might need some styling product to make it stay longer than for a short photo shoot in my garden. The shoes was an old charity shop find, probably from the 1990’s, but a decent mimic of 1920’s styles. Having seen how it looks on me, I’ve decided that I sort of like the early 1920’s. Even though it’s so loose and completely unfitted, not something I usually find flattering on me, I did feel nice in this dress. There just might be more 1920’s for me in the future. I like the neck line details a lot! The dress is so pretty on you. I think you did a great job! Love this so much! Housedresses are just the best! This is so fabulous–I really like the early 1920s as well (I don't care as much for the latter half of the decade). 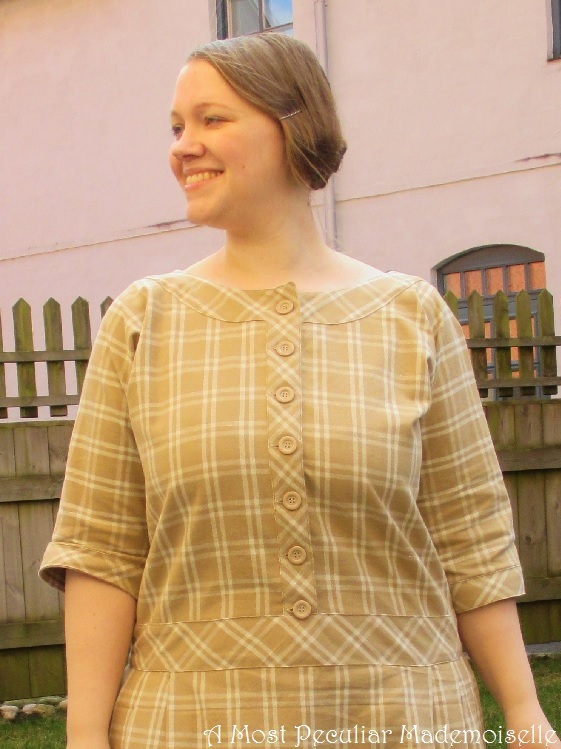 I made some early 1920s garments last summer and they were so comfortable! 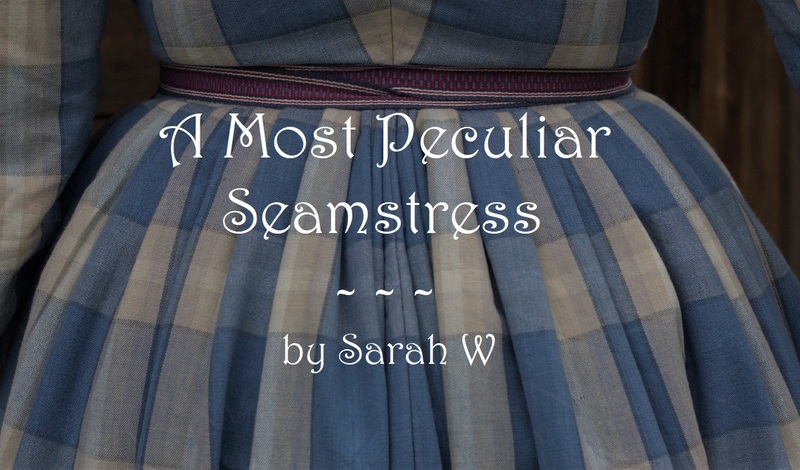 You've really outdone yourself, especially with the additional hand sewing challenge! !